I've long been fascinated by Greek mythology. I've read much on and related to the subject. Books from Bulfinch, Campbell, and Evslin populate my many shelves. Over the years, this fascination with Greek myth translated into a budding fascination with the ancient Greeks, themselves. Ultimately - and relatively recently - that fascination became a fascination with anthropology in general (also kick-started by a sociology glass I took many, many years ago). Anyway, a while back I bought The Ancient Greeks For Dummies. I can't remember the specific reason for the purchase, but it probably had something to do with a handful of stories I was writing (not the least of which would've been "A Dragon in Winter," "Apollyta and Arteseus," and "The Seventh Goddess"). Whatever the case, after years of collecting dust, I wanted to read one of the many books on Greeks and Greek mythology that stared me in the face every time I sat in my office. 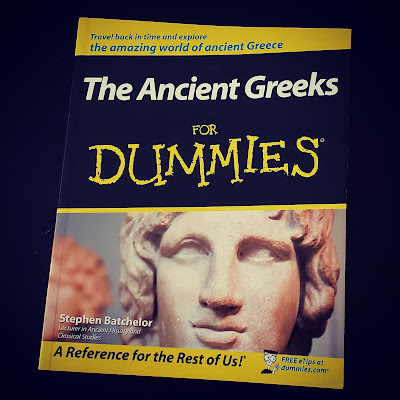 I was going to start with Robin Sowerby's The Greeks, but I figured it'd be better to ease into it with the "For Dummies" book. I love the concept of the "For Dummies" series, but, man... they can write at and for a very, very young and uneducated audience. Reading "For Dummies" books gets really annoying with the heavy self-referencing cross-references, even within paragraphs on the same friggin' page, and the playful commentaries sometimes provided by the writers can seem wholly unnecessary and a waste of time and space. That stated, I really like The Ancient Greeks For Dummies. It's amazing to me how much we already know of the ancient Greeks, simply because of their pervasiveness - obvious or not - in Western culture. But, I will admit, there are many holes in my knowledge of Ancient Greece, and this plugged several of the more egregious of them (particularly regarding the Peloponnesian Wars). Anyone interested in the people or the era, but don't feel like putting in too much time on it, this is your book. You may find yourself wanting a greater challenge afterward, but the author - Stephen Batchelor - gives you a nice list of ten books to follow-up with.